Solange Knowles' Wedding Gown Was Flawless — But, Were We Really Expecting Anything Else? Big wedding news, guys. Big, big news. In case you were living under a rock this weekend, Solange Knowles married her boyfriend, music video director Alan Ferguson. The ceremony was held on Sunday at the Marigny Opera House in New Orleans, with Beyonce, Jay-Z, Blue Ivy and other celebs in attendance. But what we all want to know, of course, is what Knowles' wedding dress looked like. Amazingly, there were basically three! 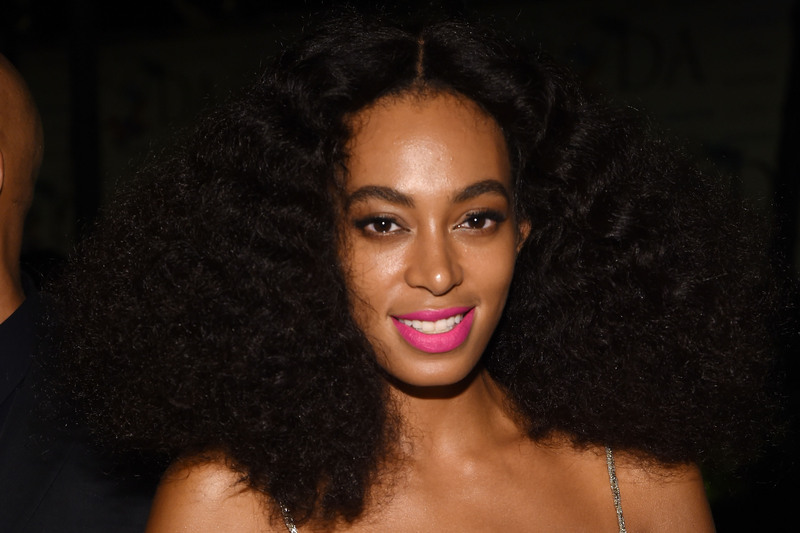 The night before the ceremony, Knowles was spotted wearing a white, long sleeved V-neck dress, gold heels, and a red lip at her pre-wedding movie party. Completely flawless, of course. Before tying the knot, Knowles wore an ivory jumpsuit and heels whilst riding a flower-covered bike with her husband-to-be. Such a cute, down-to-earth added touch. Now... for the wedding dress! Knowles looked stunning in a floor length ivory gown, matching cape, and gold cuffs. The wedding portraits by Vogue speak for themselves, really. Bey and the rest of the fam wore all white and held statue-like poses in the middle of what appears to be a rustic ballroom. They’re clearly not your typical and cheesy "hold-a-bouquet-and-smile" wedding photos. And — of course — they look way better because of it. SIGH. This family can do no wrong. Let’s hope the newly married couple celebrated with a few of Bey’s songs at the reception. Thoughts? Personally, I love it! It’s classy, but still has that glamorous Knowles touch. After all, could we really expect anything less from the fiercest family in America? Obviously not. Wedding dresses are becoming less traditional — and that’s how they should be. Tying the knot is a bride’s big day, so she should be able to wear what truly reflects her personal style. If that’s a classic, Kate Middleton-esque wedding gown, great! If not, why not bring a unique touch to your gown? Best wishes to Alan and Solange!